Sometimes referred to as “The Mitten” or “The Hand” because of its shape, the Lower Peninsula of Michigan is generally flat and comprises two-thirds of Michigan’s land mass. 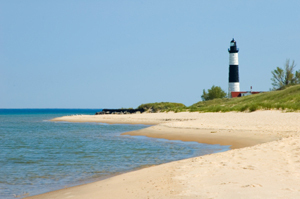 The Lower Peninsula is often divided into the sub regions of Northern Michigan, West Michigan, Mid-Michigan, Southeast Michigan and the Flint/Tri Cities area (also known as “the Thumb”). The peninsula is marked by many lakes, marshes and inland rivers.